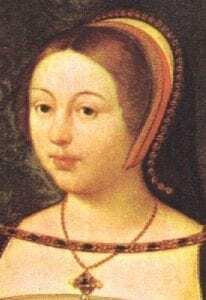 Margaret Tudor was born on 28th November 1489 at the Palace of Westminster. She was the eldest daughter of Henry VII and Elizabeth of York and was named after Margaret Beaufort, her paternal grandmother. She was the couple’s second surviving child, her brother Arthur had been born in 1486. Margaret was christened two days after her birth at St Margaret’s Church, Westminster. Her godparents were her grandmother, Margaret Beaufort; Lady Berkeley, Duchess of Norfolk and the Earl of Shrewsbury. Like most royal children of the time, Margaret saw little of her parents. Her father, King Henry VII spent most of his time dealing with the establishment of the new Tudor dynasty and the government of the country. Her mother , Elizabeth of York, was pregnant for most of Margaret’s childhood giving birth to seven children in total, of which four survived to adulthood. Margaret’s younger brother Henry was born in 1491 and her younger sister, Mary in 1496. Margaret spent much of her childhood with her brother, Arthur and they shared lessons which were overseen by their grandmother, Margaret Beaufort. Margaret received a good education but she was not overly interested in learning and much preferred being involved in court life. She loved wearing beautiful clothes, taking part in pageants, music and dancing. From the moment of her birth, Margaret was a marriageable asset to her father, to be used as leverage to secure favourable alliances or treaties. In 1496 Henry VII wanted to stop King James IV of Scotland from helping the pretender to the throne, Perkin Warbeck. He offered Margaret as a bride and James accepted. When Margaret was ten years old she was betrothed to the Scottish King who was fifteen years older. On 14th November 1501, Margaret attended the wedding of her brother, Arthur, to Catherine of Aragon at St Paul’s Cathedral. She enjoyed the event immensely and wore a beautiful crimson dress trimmed with fur. She was also on her best behaviour because ambassadors from Scotland were at the wedding to observe her behaviour and report back to James IV her suitability as Queen of Scotland. On 24th January 1502, a Treaty of Perpetual Peace was agreed between Henry VII of England and James IV of Scotland. It was sealed the next day with the proxy marriage of Margaret and James IV of Scotland. The Earl of Bothwell, Patrick Hepburn, stood in for James IV who remained in Scotland. In late March 1502, news reached the English court that Margaret’s brother, Arthur, and his new wife, Catherine of Aragon had been taken seriously ill, the following month news of Arthur’s death reached the London. The royal family were deeply shocked and distressed by the death of Arthur who had been expected to continue the Tudor dynasty. Tragedy struck the Tudors again the following year when Margaret’s mother, Elizabeth of York, died on 11th February 1503 following the birth of a daughter, Katherine who had lived just a few days. On 8th July 1503, 14 year old Margaret began her journey north to Scotland to marry 29 year old King James IV and become Queen of Scotland. She rode in a litter hung with cloth of gold embroidered with the royal arms of England. A blue canopy lined with bearskins topped the litter. She was accompanied by 2,000 lords and ladies dressed in bright colours. The journey north was difficult because many roads were little more than dirt tracks but the party reached Scotland and Margaret made formal entry to Edinburgh on 7th August 1503. 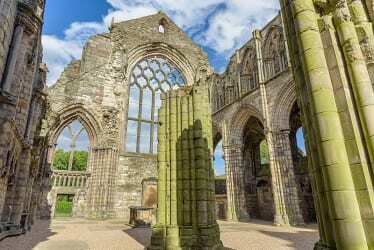 Margaret married James IV of Scotland in Holyrood Abbey on 8th August 1503. She wore a gown of white damask bordered and lined with crimson velvet with a gold and pearl collar round her neck. She wore a crown and veil over her long fair hair. James wore white damask embroidered with gold and lined with sarsenet. He wore a black velvet jacket with sleeves of crimson satin, a doublet of cloth of gold and crimson hose. The wedding was followed by many days of jousting, balls and feasts. James gave Margaret Methven Castle, Stirling Castle, Doune Castle, Linlithgow Palace and Newark Castle as a wedding present. In March 1504, Margaret was crowned Queen of Scotland. Although her new husband was kind and she had everything she wanted, Margaret was very homesick. The Scottish court lacked the gaiety of the English court and would have seemed very boring in comparison. However, as time passed Margaret became accustomed to the life. James, Duke of Rothesay was born 21st February 1507 at Holyrood Palace and died shortly after his first birthday on 27th February 1508. 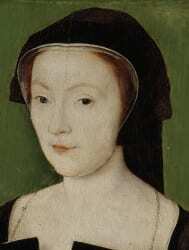 A daughter was born 15th July 1508 at Holyrood Palace, she died later the same day. 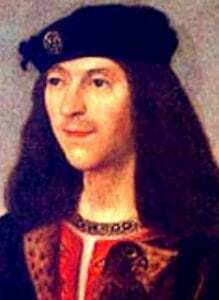 Arthur, Duke of Rothesay was born 20th October 1509, he died on 14th July 1510 at Edinburgh Castle. A daughter was born in November 1512, she died later that day. 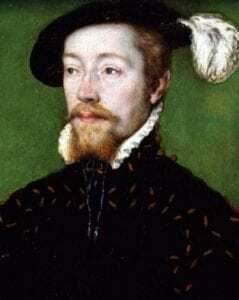 Alexander, Duke of Ross was born 30th April 1514, he died 18th December 1515. In April 1509 Margaret’s father, King Henry VII of England, died. Her brother succeeded him to the throne as King Henry VIII. Margaret’s brother was not interested in maintaining peaceful relations with neighbouring countries but wanted to emulate King Henry V’s conquests of France and in 1513 he invaded France. Scotland and France had a tradition of mutual support, known as the Auld Alliance, and King Louis XII of France called for Scottish support. James sent an ultimatum to Henry VIII stating that he would invade England unless the invasion of France was called off. Henry ignored James’s request and James crossed the border into England. The Scots and the English met at Flodden Field on 9th September. James and many leading noblemen were killed on the battlefield. Margaret’s son James became King James V on the death of his father and Margaret was nominated regent for the young king for so long as she did not remarry. However, not all Scottish nobles were happy with this decision and felt that Margaret, as an English woman, would not make decisions in best interests of Scotland. Instead they put forward John Stewart, Duke of Albany as a better choice. Before matters could come to a head, news leaked out that Margaret had secretly married Archibald Douglas on 6th August 1514. Margaret was removed from the regency and the Duke of Albany was named regent in her stead. The Scottish council also determined that by re-marrying Margaret had forfeited the right to raise her own children. In August 1515 she was forced to place her two sons, James and Alexander, in the care of Albany. Margaret, concerned for her life, fled to England accompanied by her husband. They went to Harbottle Castle where they were given shelter by Lord Dacre, Warden of the Marches. Two months later her daughter, Margaret Douglas, was born. In December 1514 Margaret learned that her younger son, Alexander had died. Her husband, Archibald Douglas, decided to return to Scotland where he made peace with Albany. Once she had recovered from the birth of her daughter, Margaret went south to visit her brother in London. While in London she helped to negotiate a peace between Scotland and England. Margaret returned to Scotland in June 1517 but she was not fully trusted and was only allowed to visit her son, King James V, under supervision. Margaret also learned that her husband had been openly living with Jane Stewart and decided to divorce him. Margaret wrote to her brother, King Henry VIII of England, asking for his support in gaining a divorce but he refused to give any assistance. With no support from her brother Margaret began to work with her husband’s opponents and openly supported Albany’s regency. However, when Albany returned to France she took back the regency for herself and took her son James to Edinburgh. In August 1524 the Scottish council ruled that 12 year old James was old enough to rule Scotland. He made his mother his chief councillor and adviser. However, Margaret’s husband, Archibald Douglas, Earl of Angus, felt that he should have more control and demanded a seat on the council. This was reluctantly granted by Margaret in February 1525. Once a member of the council, Angus worked to undermine Margaret and within a month he had taken custody of James and was ruling on his behalf. In 1527 Margaret was finally divorced from Angus. A year later in April 1528 she married Henry Stewart who had been her treasurer. 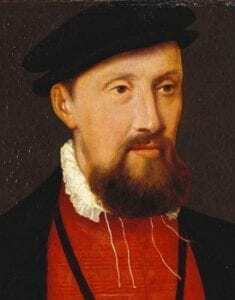 In June 1528 James V managed to take control of Scotland and exiled Angus. Once again he appointed Margaret his chief adviser. He also created Margaret’s third husband, Henry Stewart, Lord Methven. Although Margaret would have liked Scotland to have a closer relationship with England, her son wanted to strengthen relations with France and negotiated an alliance with Francis I of France. In January 1537 James married Madeleine, the daughter of Francis I at Notre Dame Cathedral in France. Sadly the marriage only lasted six months as Madeleine died in July 1537. The following summer James married Marie de Guise and Margaret had a good relationship with her daughter-in-law. By 1538 Margaret’s third marriage had broken down. Lord Methven spent vast sums of Margaret’s money and had taken a mistress. Once again Margaret wanted a divorce but her son, James V, refused to allow her to divorce. In 1541 Margaret died following a stroke at Methven Castle, Scotland. She was buried at the Carthusian Abbey in Perth, Scotland.